As the end of the year approaches, my thoughts have turned to selecting my personal "Game of the Year." It probably won't surprise you to know that New Super Mario Bros. Wii is on the short list. However, while I may be an inveterate Mario fanboy, I try not to let my love blind me. In that spirit, I'll attempt to offer some clear-eyed criticism of one of my favorite games of the current console generation. Forgive me, Mario! When it comes to player avatars, I prize function over form. Whenever I play an RPG, I construct my party based on skills rather than my interest in character stories. In LittleBigPlanet, I've been known to rock a naked Sack Boy out of sheer disinterest in clothing him. When playing Rock Band, I'm the one rolling his eyes while people fiddle with their characters. However, options and customization are key components for many players, and I do understand the importance of offering diverse character options. Disappointingly, with a crew composed of Mario, Luigi, and two Toads, NSMBW is devoid of playable female characters. Miyamoto's excuse that Peach's dress would require more work to animate is baffling: Is Nintendo really that hard up for talented artists, or the money to pay them? Even if there were technical issues, why not just give Peach a pair of royal overalls? Or, if Peach must be kidnapped, why not bring one of the many extended cast members into the Big Leagues? It is sad that two of the four playable avatars are only differentiated by a palette swap, especially since Toadette was passed over. 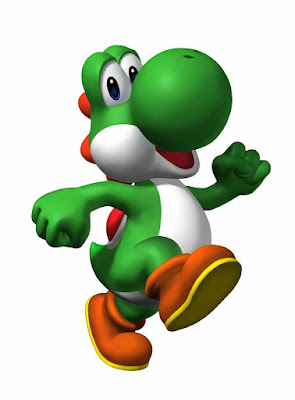 I was delighted to see Yoshi make his triumphant return in NSMBW. I was less thrilled to find out that Yoshi seems to have lost a step during his hiatus. In Super Mario World, Yoshi gained different powers depending on what color shell he ate, but in NSMBW, this power is missing. Given enough time, Yoshi used to be able to swallow hard objects like shells, but in NSMBW, Yoshi's digestive tract is decidedly less durable. I also think that tilt control could have made for an interesting egg-throwing mechanic, but evidently something is disrupting Yoshi's ovulation. Despite being somewhat nerfed, Yoshi still ads pleasant variety to the stages he inhabits. However, Yoshi has grown more territorial over the years and now refuses to leave the levels to which he is endemic. This is a missed opportunity, as being able to take Yoshi to different stages would have provided replay value as well as the opportunity to barter with friends. If only one player out of four finished the stage mounted, Yoshi would then become a status symbol, or perhaps even a bargaining chip to be used to curry favor with certain players ("I'll trade you my Yoshi for the next penguin suit."). NSMBW creates a rare dynamic of competitive cooperation, but more could have been done to enhance the inter-player negotiations. The ability to trade extra, individually collected items or to bestow hoarded 1ups on other players would add currency to the couch-centered meta-game that takes place alongside the on-screen action. Like theoretical Yoshi-trading, being able to strike deals using in-game resources could be used to both help and trick other players, making it a perfect fit for the game's ambivalent stance on teamwork. NSMBW contains a new version of the "Go Fish" style game present in Super Mario Bros. 3. Matching cards with the same item on their face allows the player keep that item. Unlike SMB 3, NSMBW fails to give the player a short peek at the deck before all the cards are flipped over. This removes any skill from the game, and instead turns it into a game of chance. These seems particularly incongruous with the overall Mario ethos, as Mario games tend to reward those that make their own luck. For those new to the game, luck is a difficult thing to make. Although coated in a cartoonish veneer and distributed on a system marketed to those new to video games, NSMBW does not coddle its players, which may end of hurting its ability to teach them how to play. While the early levels have fewer hazards than later ones, the obstacles carry the same danger and consequences as late-game challenges. A koopa deals out the same amount of damage whether you fight it in the first level or the last; the first pit you must jump is just as bottomless as the last one. Unlike so many modern games, NSMBW does not offer a formal tutorial, and failure often means a significant loss of progress. I imagine that for someone who has only played relatively recent games, NSMBW feels a bit like a reading Shakespeare: Certain elements and themes are recognizable, but the work's elegance is revealed through slowly becoming familiar with its unique structure. 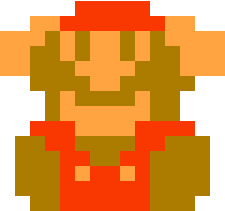 Just as contemporary English speakers get tripped up by The Bard, contemporary gamers get tripped up by The Plumber. I suspect that playing NSMBW is, for many players, the equivalent of trying to converse in French having only taken one course back in middle school. Compounding this difficult learning process is the potentially daunting prospect of being surrounded by players who already speak the language. While immersion may ultimately be the best route towards fluency, it is an initially painful process, one that might be a turnoff new players. Now that I have that out of the way, I will feel less guilty about any additional fawning posts I write about the game. If you have yet to play the game, don't let these nitpicks scare you off: NSMBW is an excellent experience. With any luck, we will see these shortcomings rectified in the hypothetical and poorly named sequel: New Super Mario Bros. Wii 2! On second thought, maybe "New New Super Mario Bros. Wii" works better. The reason, at my least guess, behind Mario, Luigi and Toad x2 is they all very different colour palettes (red, green, blue, yellow). With as much stuff as is flying around the screen, behind able to track your character is vital in the multiplayer. Granted, that is compromised a bit by having two characters with identical silhouettes. But given how small all of the character are, it's less bad than have two similar palettes. Does the make the particular choice of characters any less lame? Nope. Daisy has a primarily yellow palette and I'd rather see her for a choice than an alt-textured toad. Never thought of that reason Nels, but yeah, Daisy and Peach could work even better than the Toads. Have you guys beated it yet?, come to think about it, I know very few people who actually beated the older Marios (at least until Mario 64)and I'm curious to know if this game is also made in that hard to beat fashion. Beating the older marios came with a great sence of pride, and maybe thats another reason why people have such high value for them, but if in NSMBW things are more easy (and I guess much of it could be becasue of the saving system) is the fun factor from the multiplayer capable of filling that hardness gap? You're right: Daisy gets no love! I did finish it, and, even though I found it significantly easier than the old Marios, it was pretty satisfying. The very last level gets pretty rough. There's also a 9th world that gets pretty crazy. I think that the multiplayer has the potential to make the game really difficult, but it is a difficulty that is completely new to the Mario franchise. Because the multiplayer is so unique in its "competitive cooperative" style, the mix of people you play with makes a huge impact on how rough things get. Extremely good points on the whole, and the lack of a female playable character is not something that I'd even considered! Most interesting. Have you had a chance to play the game? Any nitpicks bugging you, or do you share my unabashed Mario obsession?